Working on the (likely not entirely correct) premise that Lola Pug is happiest when she’s with her mama, I take her on as many of my adventures as I possibly can – as long as it’s safe for her to come along, of course. I thought it only fair to share my latest passion with her. The instructors I know in the sport encourage canine participation, and the way I figure it, the more time I spend with the little bean, the better. So I got her all geared up. …but she seemed to settle in quite nicely after she realised there was no dry escape route. …and I think she looks rather regal, to be honest. But I might be confusing “regal” with “coldly plotting her revenge”, because she sure was happy to hit dry land. 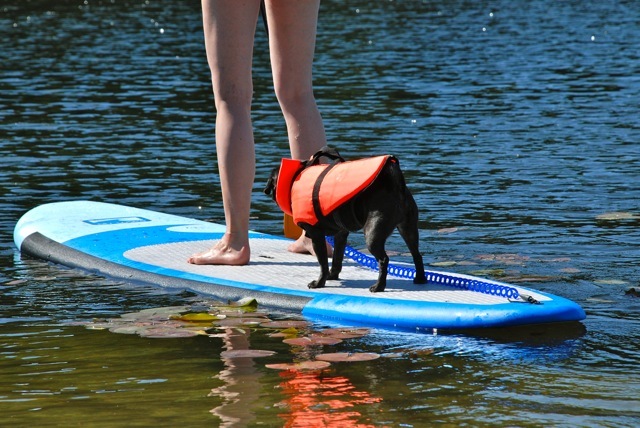 Needless to say, like Lola Pug, I am determined and stubborn at times, and this weekend was not the last time that Her Royal Highness will see the world from a paddle board. 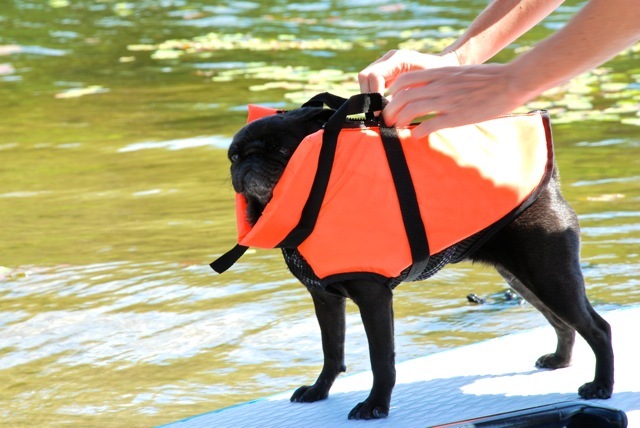 LAKE HO, pug! Summer has just got a whole lot more FUN for us! Well. It has for me, at least. Whether it was against your will or not…. Lola, you are a brave pug. Thanks, Sabrina! If only I weighed a little bit more, I couldn’t be picked up so easily…. Lola Pug! Wow! What a crazy adventure! Payton would be quite impressed with you, I’m sure. I have to admit that the photo of your feet getting wet made me laugh. I bet your mum really enjoyed having you with her…you are a good sport, Lola. Oh, Christy, I have no choice. 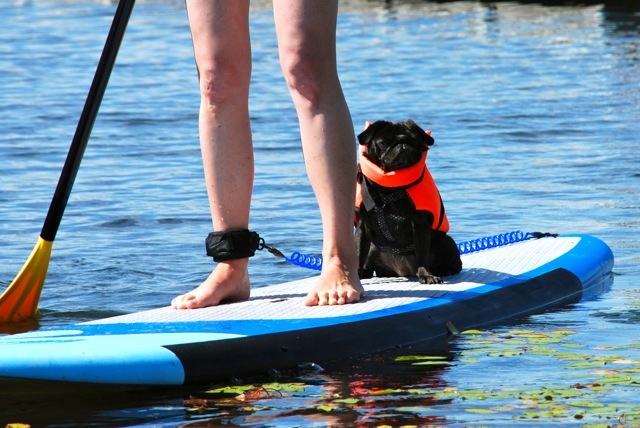 I am but a wee pug, and my mama is a gargantuan Amazonian who can pick me up and make me do things at her whim. Oh, the horror. What a great idea. I think it’s so nice that you try to include Lola in everything that you do. She has to keep me distracted from my plotting SOMEHOW, Mel. If it weren’t for these little diversions, I would *surely* be ruling the WORLD by this point. We are reporting your mama for abuse to the Anti Wet Pug League. And there’s room on the bed here for you when the Authorities grab you from that heartless water loving woman. Thank you, my friends! PUG SOLIDARITY! Oh, Ruby, your kind words at least do something to mitigate the lasting horror of that weekend. Thank you. “Nothing to do but sit here and hate you.” – HA! Poor Lola! I am super impressed that she just sat there though and didn’t jump off. Regardless of the water being wet and all. Very calm under the circumstances. Good girl, Lola! I am, if anything, composed, my friend. Mama thought I might jump off, so she was prepared to abandon ship, as well. So she says. Thank you for reading my Pug Thoughts. I sometimes think that no one can hear my desperate pleas for help. Lola, the water is a wonderful thing to be on or in! Don’t despair, just enjoy the adventure! I am still not a convert, Gampy. Water means wet, which means unhappy me. And it’s ALL about me, no? Will you PLEASE talk some sense into my mama, Melinda lady? Miss Lola, you’re so brave! 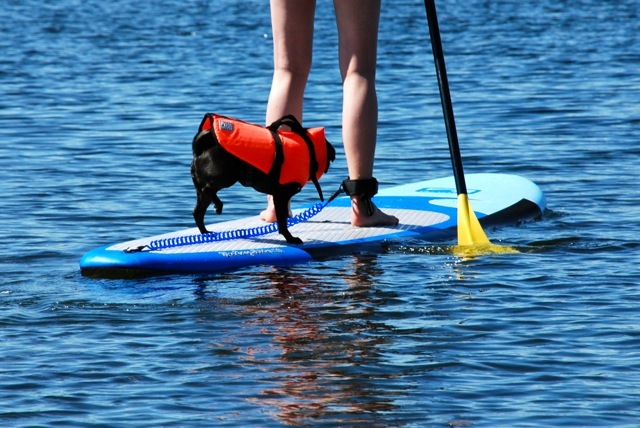 Congrats on the paddle board. Haha! I see we have the same lifejacket! Oh, Jack, I sure don’t understand you at all. 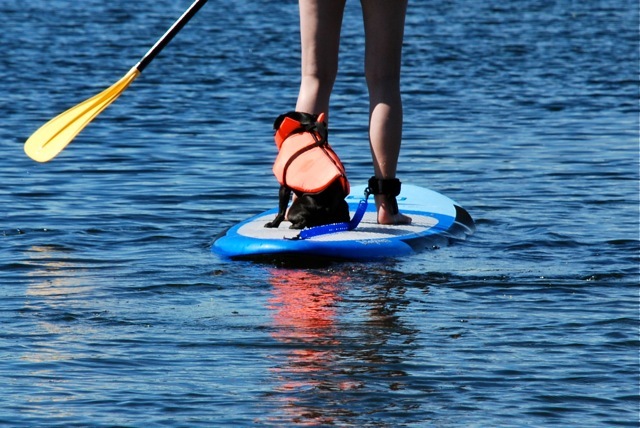 My mama tries to get me to like going out on the water, but I’m just TOO MUCH of a PRINCESS to like it! I guess I had better get used to it. Any tips you care to share? I just HATE it all! Dear Lola, You are 2 cute! I think your mom is smart to take you out and try new things. Start loving it, it’s really fun! I get to bark at birds and people laugh when they see me and take pictures. SUP really is really relaxing, I love it so much. If your mom keeps taking you you’ll start to love it. I liked it from from the beginning, but then I like adventures! Hey Lola, send me your cell phone number and we can send each other pictures of our peeps…HaHa, aren’t humans weird?